Fashion faux pas: Wear the coat or reupholster a chair? 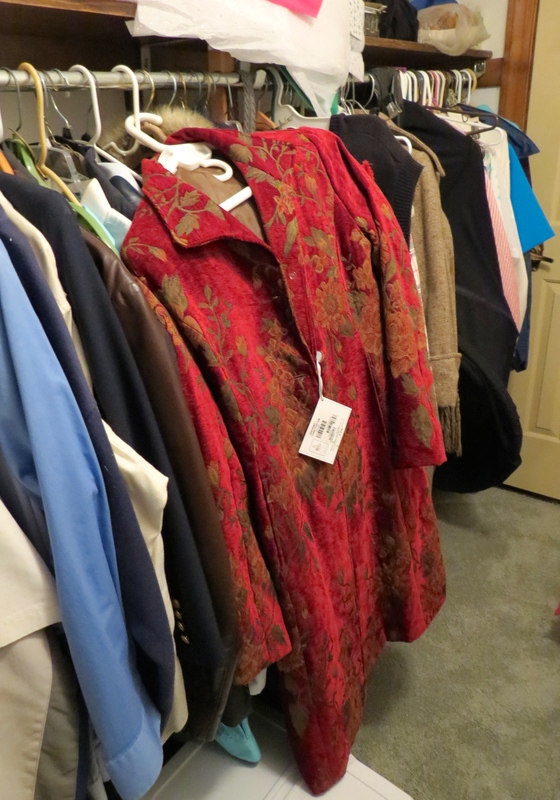 I often purchase clothing that I believe is a great buy: on sale, has all the right elements of color and style, yet when I bring it home, the item remains hanging in the closet, with the tag still attached. I found a coat in the bowls of my sister’s storage closet. I pulled it from the other temporary cast offs, attracted by the color and velvety fabric. I said to my sister, “It looks like it has possibilities.” And immediately tried it on. For six years the coat stayed in the closet. Was it time to release it from its confinement? The coat felt heavy, and in response, I slumped my shoulders. The sleeves were too long and there was too much padding on the shoulders. Still, I checked it out in the mirror hoping it might recover if only I hem it or take in or something! In the end, all I could do was laugh with the realization that this coat would return into the back closet. What do you think? Is this redeemable? Or should I pass it to a thrift shop? Or would this be best on a chair? Post your comment below and let me know what you would do. To Write or Not to Write about Fashion? Inspired by Flora’s descriptions, I returned to compiling pictures and content for this post. By looking at the way children dressed, we can discover a few clues about life in the 1950s. When I was a little girl, growing up in a working-class suburb of Philadelphia, I remember my mother dressing my sister and I in matching outfits. I couldn’t find any history about this custom, but I remembered that in the movie, The Sound of Music, Maria dressed the children in matching play clothes. Dressing children alike may be a way of cementing family kinship. My mother fostered a close relationship between my sister and I, and dressing us alike may have been part of that plan. I never minded dressing the same as my sister, but I didn’t know there was an option. Mom selected all of our clothes, and we wore whatever she purchased for us. With play clothes, we had some degree of flexibility in picking out what we wore for the day, but for school or dress up, Mom was fully in charge. I don’t remember rebelling against her choices because clothes were not that important to me. In our school and neighborhood, children were clean and neatly dressed. Because we came from a fairly homogenous community, there seemed to be little emphasis on clothing as fashion statements. No one dressed better than anyone else, as I recall, and we didn’t talk about clothes. I can remember on only one exception. In third grade, a girl joined our classroom in the middle of the year, and I noticed she looked disheveled. At first, I thought perhaps that just moving in created a lapse in hair and clothing care, but her appearance never improved. That one example stood out because uniformity in neatness prevailed. Three Basic Outfits. We wore three basic outfits, always starting with white cotton underwear, including an undershirt, with short sleeves for winter and sleeveless for summer. Play Clothes: A Hodge-Podge but Sometimes Matching. Pants, peddle pushers (pants that ended between the knee and the ankle so material would not get caught in bicycle parts), shorts, shirt or blouse, light canvas sneakers and socks. In the summer, we would wear rompers, tied with a bow at each shoulder or one-piece zippered short and shirt set. A “skort,” a very short pleated skirt with attached matching bloomers underneath was another option when the weather was warm. This was the age before the t-shirt, which we never wore. In winter, corduroy pants lined in flannel would keep us warm while sledding. As older children, we transitioned from long coats to the more practical “car coat”, which came to just below the waist, square-cut in shape and usually with an attached hood. School Clothes: Keeping Order with Flouncy Attire. Dress or skirt, slip, socks and sturdy shoes (white and black saddlebacks) or shoes with straps or laces or Mary Janes, which was a slip-on dress shoe made of black patent leather, usually with a strap that buckled on the side. 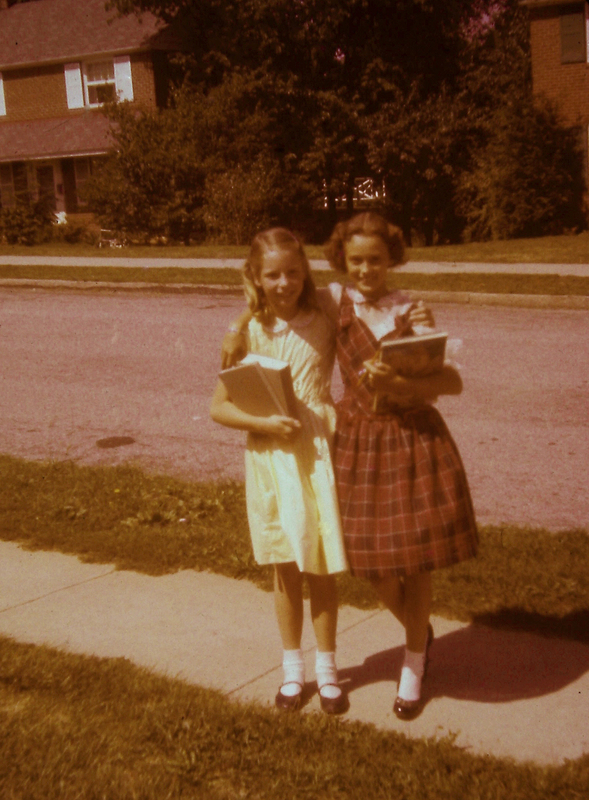 Girls’ clothes mimicked women’s fashion trends at the time: full circle skirt and a cinched waist. Full skirts were always worn with a petticoat or slip. Hemlines remained above the knee, at varying lengths. Almost every public school in the U.S. required that girls wear dresses or skirts. I didn’t like wearing dresses because keeping modest while on the playground was a continual nuisance. Every girl knew the one rule of wearing a dress: keep it down. Also, there was a rule that your petticoat should not hang below the dress, requiring some effort yanking on straps to make the necessary adjustments. Sometimes I would slip slacks on under my dress, which was strictly against school rules and almost immediately the teacher would ask me to remove them. Girls could change into shorts or pants for gym class. Dress Clothes: Petticoats and Mary Janes. Church, visiting or special occasions meant a complete outfit including a fancy dress, petticoat, Mary Janes, socks, coat, hat, and sometimes purse and gloves. Crinoline petticoats made the dresses flair out. In the winter, wool coats and matching leggings, usually with side zippers, would keep us warm. Coat collars were sometimes trimmed in velvet. Sunday School always required a fancy dress. Our family was not religious, but my parents must have felt that we have some religious training and dress the part. Easter brought out the best finery, including an Easter bonnet, trimmed with ribbons and silk flowers. When we were older, we wore suits for Easter. Mom fixed our hair every morning, usually in a pony tail or left down, supported by four colored barrettes. Most nights, Mom would roll our hair in soft curlers before we went to bed. She didn’t like hair too much longer than shoulder length. For some reason, I hated having my hair cut, which resulted in a confrontation with Mom. I still have that vision of Mom coming toward me with the scissors, and no amount of tears would prevent the inevitable chopping off of a couple of inches. I always wanted long braids, but Mom disliked braids. Girls had all ranges of haircuts from short bobs to long hair down the back. However, we didn’t seem to care about each other’s style. In the early 60s, we stepped into another time where hair styles became more important. My sister went for her first hairdresser appointment when she was in 5th grade and had her hair cut in the famous “page-boy fluff”. When I became a parent, I read many texts on parenting techniques, and most of the advice suggested to allow children to select their own clothes, both to purchase and to wear. That was surprising to me given that my own childhood experiences that put Mom in charge. I would agree that it is probably is best to allow children to make their own choices. Perhaps, however, allowing those choices might direct the child’s concern about outward appearance, which may not be the place that we want children to focus most of their attention.